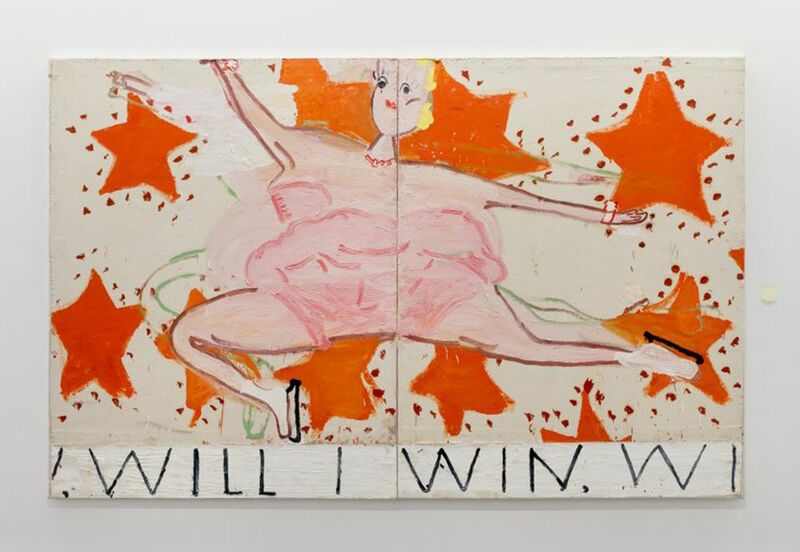 “Her medium is energy,” was the apt comment by the artistic director Hans-Ulrich Obrist during this week’s opening of Rose Wylie: Quack Quack (until 11 February 2018) at the Serpentine Sacklery Gallery. This certainly seemed a good way to sum up the animated, unruly parade of footballers, Hollywood royalty, cut-out dolls, as well as Queen Elizabeth, all of which—along with rumbustious dogs, elephants and much more—have been whipped into existence with lashings of oil paint. In one painting, even a park bench seems poised for lift-off. And the fact that some of the works had only recently left the studio was confirmed by a distinctly discernible whiff of oil paint. The show of work by the 83-year-old British artist spans the late 1990s to the present day and includes works never previously exhibited. There are currently five exhibitions on at Store Studios, a former office building on the Strand that hosts temporary exhibitions and events. The venue houses Lisson Gallery’s 50th anniversary exhibition, a show by Jeremy Shaw, and a nightclub installation by Virgil Abloh and Ben Kelly. Due to popular demand, the runs of two exhibits—by Ryoji Ikeda and Arthur Jafa—have been extended until 14 December. On the ground floor Ikeda’s test pattern No. 12 is a trippy monochrome light installation, which is instantly Instagrammable. But the stand-out exhibit is a seven-minute film in a large tent on the roof of the building. Arthur Jafa’s Love Is The Message, The Message Is Death (2016) is a meditation on African-American culture and recent history through the use of found footage taken from news stories, YouTube videos, archival footage and more. The clips range from police brutality to acts of awe-inspiring athleticism and performances by President Obama and a teenage Notorious B.I.G.—all set to a soundtrack by Kanye West. This is powerful stuff from the US cinematographer. God’s hand and Jean Dubuffet’s feet are the inspirations behind Polly Apfelbaum’s new show at Frith Street Gallery, titled Dubuffet's Feet My Hands (2 February 2018). The gallery’s concrete floor is covered in four large woollen carpets, hand-woven in Mexico, that features giant footprints based on a sketchbook drawing by Dubuffet called Footprints in the Sand (1948). On the gallery walls is the series My Hands, made from ceramics in an array of colourful glazes. While the US artist has used her own hand as a template for these small wall sculptures, the inspiration for the work comes from a “floating hand of God” in the mosaics found at the Sant’Apollinare Nuovo basilica in the Italian city of Ravenna. The—for Apfelbaum—unusually muted colour scheme means the gallery space has a calming atmosphere and visitors are encouraged to remove their shoes and walk or sit on the carpets.